The BLS reported that payroll employment increased 192,000 in February and that the unemployment rate declined to 8.9%. If we average the last two months together – the 63,000 payroll jobs added in January and the 192,000 payroll jobs in February – there were 127,500 payroll jobs added per month. That is a barely enough to keep up with the growth in the labor force. Private payrolls were a little better at an average of 145,000 per month, as state and local governments continued to lay off workers (something we expect all year). The decline in the unemployment rate from 9.0% to 8.9% was good news, especially since the participation rate was unchanged at 64.2%. More welcome news included the decreases in the number of long term unemployed, a slight decline in the number of part time workers for economic reasons, and the decline in U-6 to 15.9% – although the levels are still very high…. Overall this was a small step in the right direction, but the overall employment situation remains grim: There are 7.5 million fewer payroll jobs now than before the recession started in 2007 with 13.7 million Americans currently unemployed. Another 8.3 million are working part time for economic reasons, and about 4 million more workers have left the labor force. Of those unemployed, 6 million have been unemployed for six months or more…. Overall this was a small step in the right direction, but the overall employment situation remains grim: There are 7.5 million fewer payroll jobs now than before the recession started in 2007 with 13.7 million Americans currently unemployed. Another 8.3 million are working part time for economic reasons, and about 4 million more workers have left the labor force. Of those unemployed, 6 million have been unemployed for six months or more. 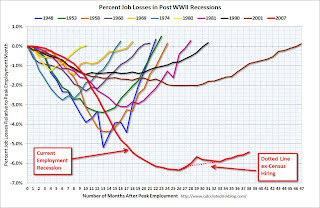 The graph shows the job losses from the start of the employment recession, in percentage terms – this time aligned at the start of the recession. Readers might remember what a muddle the January report was (see here, here, and here) due to the conflicting reports of the two primary surveys and the snow which happened in January during the survey period. If we average January and February together, it appears that the January report was somewhat negatively impacted by the weather. However, putting the two months together still leaves us with a picture that, yes, is improving. But it is still improving much, much too slowly. It will still take at least 2-3 years, if not longer at the current pace to get back to full employment. Deeper inside this month’s report the numbers on private hiring are finally starting to look better (although they’ve done even better in past recessions). Now we need to worry about the declines in government employment, particularly state and local government. All those teachers, police officers and fire fighters count as employees too. And their money and spending is just as critical to the economy as money from private employees.